It might sound odd to say, but one of the problems with the reaction to the performance of the England football team is the hopelessly short memories of England fans. Take the last World Cup as an example. In that tournament England were appalling, and duly left the tournament early. However, the awful performance was immediately spun as unimportant, because – with many new players thrust into the squad, and the ‘old-guard’ on the way out – the tournament was written off as a training exercise to prepare for the serious business of the European Championship two years later. Now, we’re kicked out of the Euros, Hodgson has resigned, and his record is to have been rubbish in two tournaments. There is no memory to the reporting or the fans’ reactions? Every tournament seems to bring with it an absurd ‘fresh-start’ or a ‘maybe-this-time’ mentality. Why don’t we remember just how bad we’ve been in the past and adjust our expectations accordingly? That would help armour us against disappointment. The English public mind is in a state of denial, because it has an unjustified level of expectation in respect to the England team. If we simply accepted we are no good, the disappointment wouldn’t be felt. Our tournament results don’t lie. Our refusal to reach honest conclusions, based on those results, is a type of lying: we’re in denial. Are we stunned by shock, and do we wallow in disapointment, when an Englishman doesn’t win Wimbeldon? No, we don’t expect to win it, because the best English players in our mens’ game are Elton John and Cliff Richard. If we accepted an ‘underdog mentality’ – like the Welsh have done, and it’s doing them no harm in this tournament – we would see everything as a success, and we’d feel good about the same performances which, while we hold onto the idea we are worthy of winning anything, are making us miserable. 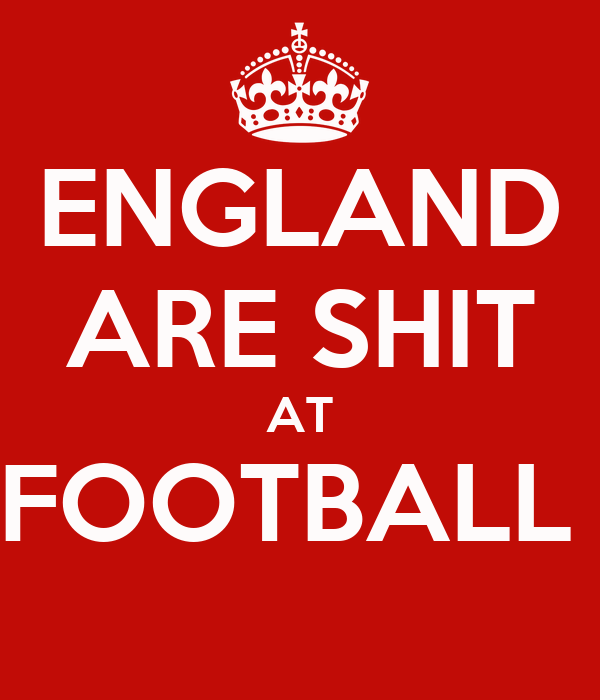 Perspective is everything, and English football lost its perspective years ago. The Empire’s gone; the country is a province of the European State; and our football team is useless. The best thing for the FA to do is to disband the national team and accept it’s over. There’s no point in yet another round of boring speculation about who should get the job. What is the point in the FA appointing someone else, claiming he’s the ‘best man for the job’, having this man then go and achieve nothing whatsoever? Poor Maria Sharapova. She’s going to be banned from Tennis for some years, and for a stupid reason. No thinking person believes she was cheating because the substance she tested positive for was only made illegal in January this year. She deserves sympathy. It’s almost certainly her ‘team’ who are at fault, here. What are they paid for? Below is an account of a better day in Sharapova’s life, and one hopes she’ll have more in the future. Maria Sharapova walked onto court to begin her attempt to win her first French Open and the expression on her face was one of stark unfriendliness. She had the look attractive and popular head-girls at English public schools reserve for uglier and poorer first-years. If it was a look of superiority, then unlike most English public school-girls, it was a justified superiority. Sharapova had more than a little fight in her; it was her natural ruthlessness which dragged her talent up to meet it. It seemed in Sharapova there was no talent without the desire to draw blood. Her opponent, Sara Errani, playing in her first Grand Slam singles final, brought her special racket, Excalibur, to the match. It was a particular racket, one she had struggled to have the right to use after buying herself out of a contract with another manufacturer. One of the commentators remarked that the match, with Sharapova in blood-letting mood, was a gunfight. That comment summed up the contest. Errani’s blade versus Sharapova’s bullets. The match was not much of a contest at all. In interview before the match, Sharapova had spoken to the press and appeared to have nothing of the “ice-queen” personality she wore on court. Her eyes appeared to change colour from a pale brown to a soft green depending on her expression, which was never cold. When she smiled she showed rounded yet prominent cheekbones which suggested the looks of a model, yet her mouth seemed to disagree. She had a serious mouth, a slightly tight bottom lip, perhaps too used to being stretched into serious expressions for her model’s face to be complete. Her eyebrows suggested her looks were not her primary concern; though shaped, there was no excessive work plucked into them. She wore diamond earrings, small stones linked into tear-drops, which were a subtle indicator of her significant if not limitless wealth. Sharapova’s attractiveness was different from, say, Kournikova’s. Kournikova had glamour, though she made one think of pretty, colourful plastic, whereas Sharapova has elegance and appears graceful and artistic on and off court. It must be said of her that she is unreasonably beautiful. One thing her face did suggest is that she had long-since mastered the art of being stubborn; here was a woman who knew what she wanted and was used to getting it. As she walked onto court one got the impression that Errani was the short, less pretty first year up against the popular head-girl. One feared for her. If a match can be lost before a ball has been struck – if a player’s sense of place can determine the outcome – then it happened here. Sharapova served first and won her first point with her second hit of the ball and took the first game easily. She broke Errani’s serve with her first break-point, taking the second game and battered Errani to take the third game with an ace. 3-0 in the first set to Sharapova and she did it in 8 minutes. At this point the commentators were concerned that Errani might not get on the board. The fourth game went to Sharapova. It was then her serve deserted her and she double-faulted to love-30 to gift three break points to Errani who, sensing she was playing for pride, took the game to the relief of the commentators. They didn’t want the Russian to humiliate her opponent but Errani’s serve was close to ten mph slower than the Russian’s, so holding it was always going to be a problem when Sharapova’s returns were fired like bullets. Swords bring nothing to a gunfight. The first set went to Sharapova 6-3 and one got the impression that score was a generous one for Errani: More a case of unforced errors from Sharapova than strong winners from her opponent. The first set should have been taken 6-1. The first game of the second set saw Sharapova go straight to love-40. Errani’s serve had gained nothing from the experience of the first set and Sharapova offered her opponent’s short-comings powerful and precise shots to rip the first game of the second from Errani. In the first game of the second set Sharapova did violence to her opponent. The match was won with that game. It was only a matter of time. Errani was never going to win. Errani played better tennis in the second set, pushing Sharapova out wide on a couple of occasions and winning the odd point on merit with skilful drop-shots, but one got the impression this annoyed the Russian rather than worried her. For all her superior muscularity, Errani could not match the power being pumped out by Sharapova’s more slender frame. Technique beats muscle every time. The final game was the most entertaining. Sharapova was serving for the championship and went down 0-15 but brought things equal straight away. Then, after some scrapping, Errani hit too long to gift 30-15 to the Russian, yet remained composed enough to lob Sharapova and get back to 30-30. Could she take the game? Sharapova took 40-30 to bring the championship point but hit too long herself – another unforced error – and it was duece. Errani, perhaps smelling a chance for the game played a sweet drop shot to take the advantage, but held it only for moments as Sharapova smacked a cross-court forehand with vicious power to drop Errani’s advantage back to duece. Sharapova then aced to take the advantage and Errani showed she had some reserves of character and dropped Sharapova again to take her back to deuce. Then it was the Russian’s turn to show what she was made of. She aced Erran to rip the advantage back and her opponent had nothing left. Moments later it was over and Sharapova was on her knees, face in hands, and she started life as the 2012 French Open champion and one of only ten female players to do the singles career slam. She revealed her face from behind her hands and all the warmth and friendliness was back. The bitchy head-girl was gone and the smile was not one designed by professional image-consultants or one preferred by her sponsors, but the radiant smile of a happy young woman. One hopes the “ice-queen” tag might melt into disuse.